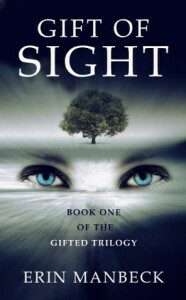 Gift of Sight appealed to me with its beautiful cover and awesome-sounding synopsis. I'm always ready to read about a feisty, sarcastic heroine. And a vengeful goddess hellbent on bringing said heroine to the Underworld? Count me in! I sympathized with Regan in her relationship with Sam right away not because I thought she was helpless - she isn't - but because she had become a shell of herself without realizing it until it had already happened. To me that's realistic and can happen even to the smartest of people. A relationship can change you and not always for the better, especially if you're with a toxic person. Sam is definitely a toxic person. I won't lie - Regan is a tough character to connect with. There were times I wanted to slap her for the way she spoke to her grandma. I get that she felt lied to her entire life, but her grandma has always taken care of her with a lot of love. Could she not see why her grandma couldn't tell her all of this until now? There was no malicious intent - things just worked out this way. Instead of feisty, I'd describe Regan as bratty. The decision Regan makes to finally get rid of Sam changes everything, much more than just ridding herself of a toxic boyfriend. She finds out a ton of things about her family that she never knew and understandably doesn't handle it well, but this news also gives her hope which she seemed to forget. I'd like to think I'd hold on to that hope and not be so angry about secrets being kept from me. At least eventually. I'm hoping that in the next book Regan's character undergoes a lot of growth. Otherwise, it'll be difficult to believe she's supposed to be an important figure in what's supposed to go down. I'm looking forward to finding out if Regan matures and is ready to face the challenges ahead of her.